A broken windshield is not only an eyesore; it’s also a serious safety issue. Thus, it’s important to pursue auto glass repair as soon as possible. But the question remains: should you hire a professional or try to fix it yourself? Here, ABRA Auto, an industry-leading auto body repair shop, discusses your auto glass repair options. Professional Project or Easy DIY? While repair kits are less expensive than professional auto glass repair, they are not as comprehensive. They only work for small chips, so if your windshield damage is substantial, you’ll need to contact your local ABRA Auto. 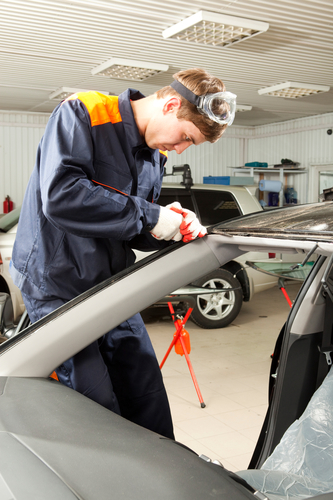 When not used correctly, DIY kits can cause additional auto body damage. They also don’t come with a lifetime guarantee that professional repair work does, leaving your vehicle and your wallet susceptible to future expenses. Call ABRA Auto for Expert Auto Glass Repair! If you sustain windshield damage, don’t try to fix it yourself. Instead, visit your local ABRA Auto. Their trained technicians have both the experience and the expertise to get the job right the first time.